To produce home fresh pasta we make some size of "Torchi" everyone complete with two dies for spaghetti and rigatoni (Venetian dialect bigoli and gargati). At your request dies for tagliolini and tagliatelle. Lillodue, a domestic appliance manufactured to the same technical features and with the same robust performance as those machines supplied to larger restaurants and commercial enterprises. 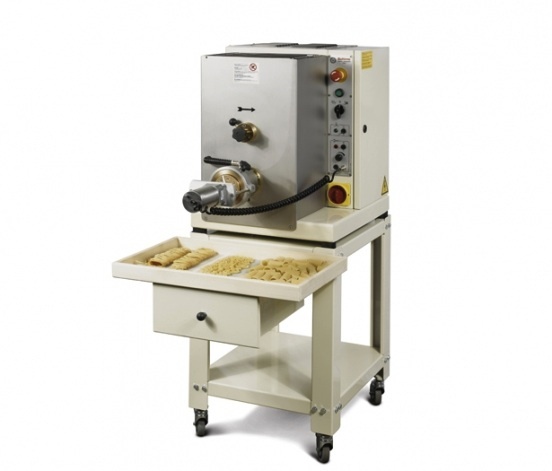 It is simple to use and enables the householder to have a pasta machine which will sit easily on the kitchen bench, plug into a standard power point and produce various types of fresh pasta easily and quickly, ready for cooking. 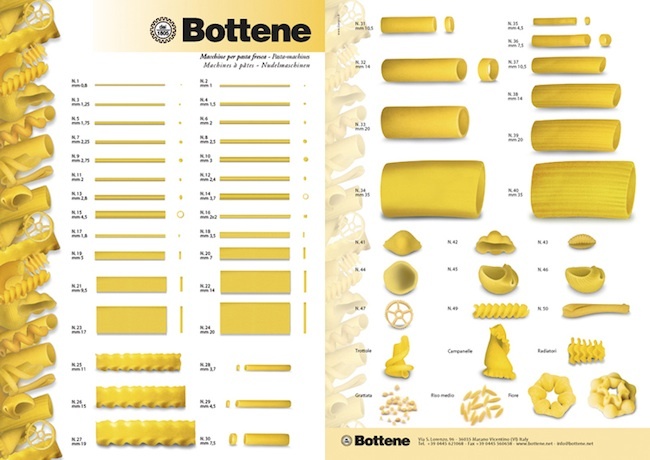 Pasta such as spaghetti, bucatini, fettuccine, tagliatelle etc. 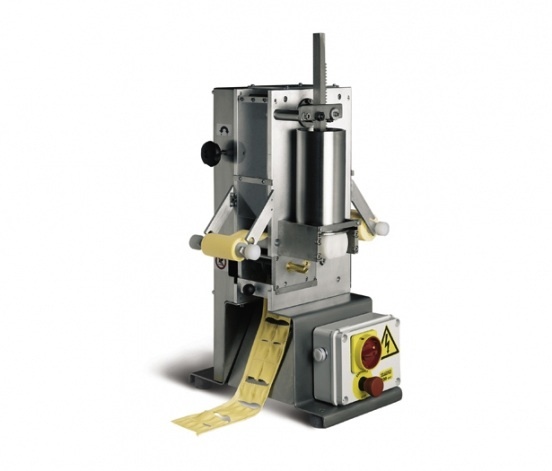 are cut to length by hand whereas short pastas require the addition of the “optional extra” automatic variable speed cutter which can cut any length from tiny soup pastas to macaronis. 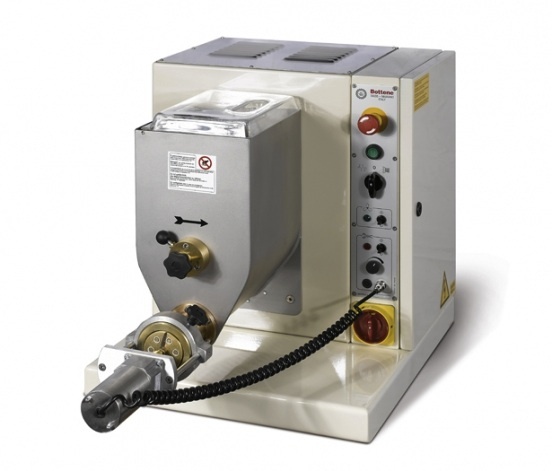 Construction of the Lillo due is of highest quality materials, skilfully engineered and finished in stainless steel complying with all safety standards CE. 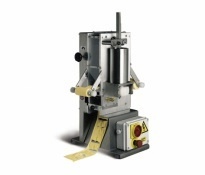 Each machine comes complete with 4 dies and there are many choices of dies to produce other shape of pasta. 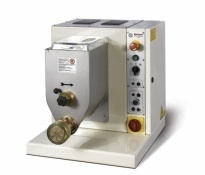 INVER 3 is a strong pasta machine practical and simple to use . It is possible to produce various type of fresh pasta with any type of flour, with or without eggs and even coloured pasta: red with tomato, green with spinach, brown with cocoa etc. It is economic because it allows you to dose with pleasure the ingredients and you can offer the very high quality of fresh pasta at the same cost of normal dry pasta. Construction of INVER is of highest quality materials, complying with all safety standards CE. 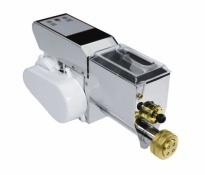 Auger and mixer removable for an easy cleaning. Each machine comes complete with 4 standard dies. 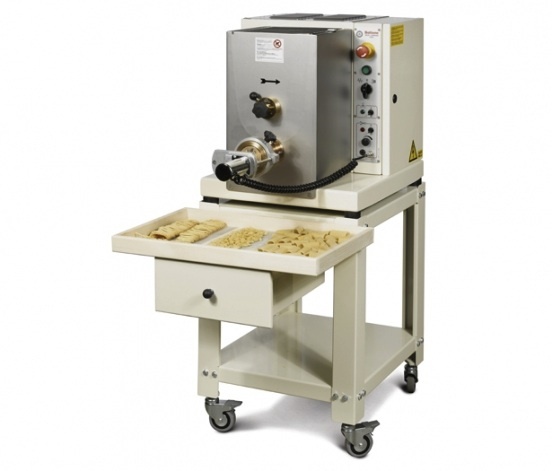 Accessories: cutter system for short pasta, stand and many type of dies are available. 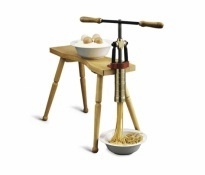 INVER 7 is a strong pasta machine practical and simple to use. 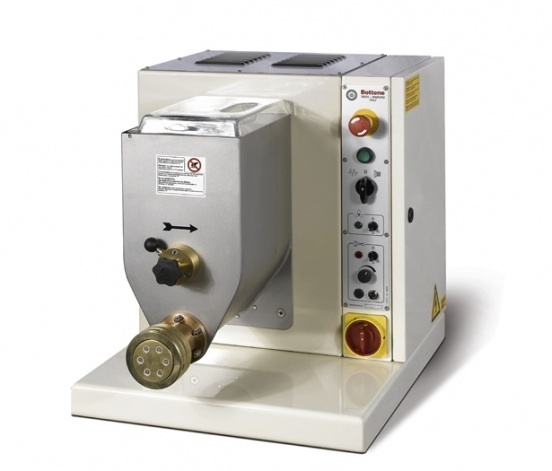 PM 80 is a strong pasta machine practical and simple to use. It is possible to produce various type of fresh pasta with any type of flour, with or without eggs and even coloured pasta: red with tomato, green with spinach, brown with cocoa, etc. It is economic because it allows you to dose with pleasure the ingredients and you can offer the very high quality of fresh pasta at the same cost of normal dry pasta. Construction of PM 80 is of highest quality materials, complying with all safety standards CE . Auger and mixer removable for an easy cleaning. Each machine comes complete with 4 standard dies, cutter system for short pasta, stand with fan. 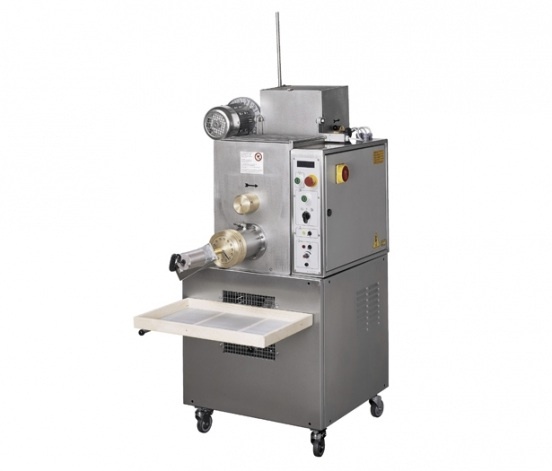 PM 96 is a strong pasta machine practical and simple to use. Construction of PM96 is of highest quality materials, complying with all safety standards CE. Auger and mixer removable for an easy cleaning. PM 120 is a strong machine, pratical and simple to use. It is possible to produce various fresh pasta with any type of flour, with or without eggs and even coloured pastas: red with tomato sauce, green with spinach, brown with cocoa. 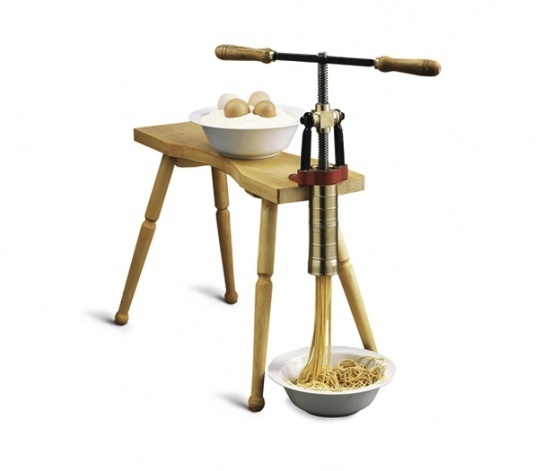 It produce long or short pastas for “pastasciutta” and vegetable soups. It is economic because it allow you to add as many ingredients as you like offering you fresh egg pasta every day at the same cost of a normal dry pasta without eggs, You can also make pasta without eggs, using hard corn and water if you want to economize. It is provided with 2 bassins for continuos and fast operations. All made in stainless steel. Complete with electronic cutter for short pastas, ventilator and 1 die. Kneader shafts and auger removable for cleaning. Available in two versions: manual and electric. Type 70 x 50 mm "1/2 moon"
70 x 60 mm / 50 x 40 mm "rectangular"
35 x 35 mm "rectangular" / 35 - 60 mm "round"